Trinity Methodist Episcopal Church, South was organized on December 16, 1866. Church services were conducted in private homes and continued by the brethren in the house, occupied by Messrs. Shilling and Young as a bakery, located on East Patrick St., near the corner of Carroll St. Junior Hall was temporarily secured as a place of preaching, whenever ministerial help could be obtained. 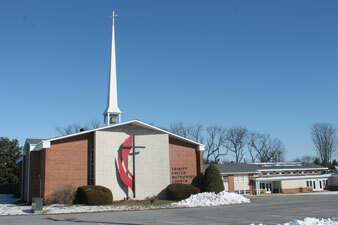 Dedication of a new church located at 5 East Second Street in Frederick occurred on January 21, 1872. In 1908, a committee began looking for a parsonage. Until then apparently the Pastors had been expected to pay house rent from their salaries. Perhaps, especially if unmarried, they would live in successive homes of the congregation. The parsonage was purchased and located at 125 East Third St. in Frederick. On May 10, 1939, unification occurred between the Methodist Episcopal Church, South; the Methodist Episcopal Church and the Methodist Protestant Church to form the Methodist Church. In 1951, the Board of Stewards and Trustees surveyed the prospects of building a new church structure for the Trinity congregation. In 1954, the survey results were inconclusive for the need of a new church at that time. Then in 1959, as physical problems continued to plague the church, renewed interest in a new church building gained support. On April 11, 1961, a favorable decision was made by the Board for the construction of a new church building. Six sites were available but after careful consideration, the site of the current church on West Patrick Street was chosen and the new edifice was consecrated on May 29, 1966. On April 23, 1968, unification of the Methodist Church and the Evangelical United Brethren Church formed the United Methodist Church. Today, Trinity United Methodist Chuch continues to grow and service both its faithful followers as well as the local community.